I've kept busy this week canning after buying more produce in bulk over the weekend. Tomatoes were on for $20/40lb. box... so you can guess what I did. Yeah, I bought two boxes! Don't these colours make your mouth water? . Tuesday, I was kept busy with a kitchen install, so I only managed to make a couple batches of apricot jam (5pts worth) on that day. Wednesday was a big day for canning. I had that second box of tomatoes to deal with and 40lbs of peaches. I started my day with the peaches. 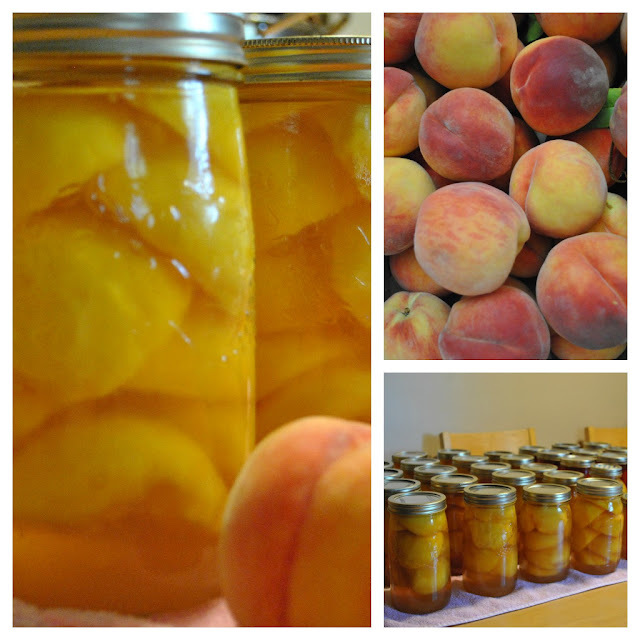 I canned 20qts of peaches in honey and used the remaining peaches to make a couple of batches of jam (4pts. worth). Then I tackled the remaining 40lbs. of tomatoes and canned 13qts. of romas. Whew. No sugar in my canned peaches! I make a light syrup using honey, to compliment the peaches. As you can imagine, with all the canning I've been doing, I haven't been spending much time in my sewing room. I'm just so happy that I've been able to take advantage of time between kitchen install work with my husband, to get some food preserved for our family. My guys are also quite excited to see the jars filling up and to have been sampling things along the way. ;o) One jar of salsa has already disappeared (surprise, surprise...lol) and any jam that wouldn't fill a canning jar has also been eagerly consumed. Canning season started with 63quarts of dill pickles... and now I've canned 16qts. & 33pts of salsa; 30qts of tomatoes; 34qts of peaches'n honey; 5pts. apricot jam and 4pts. peach jam. Since I still have some empty jars... canning season hasn't ended just yet for me! Now that I've dealt with all the fresh produce for this week, I am hoping to get in some sewing for the next blog hop (yay!) I'm participating in ... after I wash, label and pack up those filled jars from yesterday. I've been having lots of fun being a participant in the blog hops that Madame Samm puts together (with her fabulous cheerleaders! Hello, Jane, Lesley, Carol, Corrie, Cherry and Wendy...) and want to encourage you to join in. Why join a blog hop? Well, personally I've found that I've been making new friends, finding new blogs, plus I've been enjoying all the inspiration that comes from sharing the love of sewing. Oh, and how could I forget to mention that giveaways are always a part of the fun! Anyways, there's still time for you to sign up if you're interested in being a stop on the blog hop, "Wicked". Baste a quilt. Bake a cake? My first king-sized quilt top. 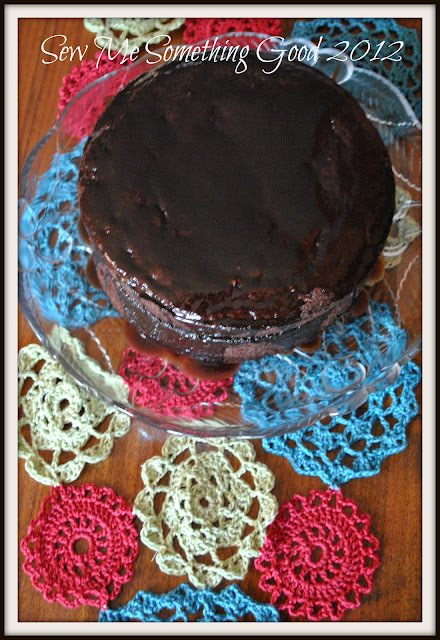 Tomato Chocolate Cake?!? Mmmm, it's delicious. **once again, I have been substituting ingredients in my recipes. This cake has coconut oil instead of the vegan margarine and spelt flour was used instead of whole wheat flour - FYI, the results still taste yummy. So go ahead, try it! P.S....The glaze is made using coconut oil, maple syrup and cocoa powder. Sewing has taken a back seat this week as I work my way through the produce I bought to can. Along with those 40lbs of tomatoes, I brought home 40lbs. of peaches. I LOVE fresh peaches. Truly nothing says summer to me the way a fresh ripe peach does. When they were first in season, I came home with a 20lb. box for eating... and we devoured every single one within that week. Obviously, double that amount wouldn't see us too far, but I thought I could at least can some for the winter months from that amount. They are every bit as sweet tasting as they look! Once those peaches were at the peak of ripeness, I set to work. Now, I don't like a heavy syrup on them because I want to taste the peach - not some sugar laden syrup. Once again, I messed around with recipes until I came up with one that suites our family's taste and it doesn't use any sugar! I actually used honey for my canning syrup. I know the canning books don't recommend this, but in all the years I've been using honey rather than sugar, I've had no problems. They are delicious! Looking for today's list of blogs for the Bowls with Borders Blog hop? Here they are! Keep hopping along... Carol has the full schedule! I just love this time of year! I've been busy filling my pantry for the upcoming months by preserving the freshness of this season. If I was to rate my family's top picks in home canned goodness... my dill pickles are at the top of their list (thank goodness, I've checked this off my to-do list! lol) and next would be my homemade salsa. While at the Farmer's Market this past Sunday, I discovered that all the ingredients I would need were in ample supply for making salsa. I was even more motivated to tackle some canning this week because I was able to get 40lbs. of roma tomatoes for only $25. Romas are just the best for salsa! Washed and ready to take a dip into boiling water to remove those skins! Salsa is not something I grew up with, but marrying a man that loves his salsa (the hotter, the better! ), meant that I was keen to learn how to make my own. 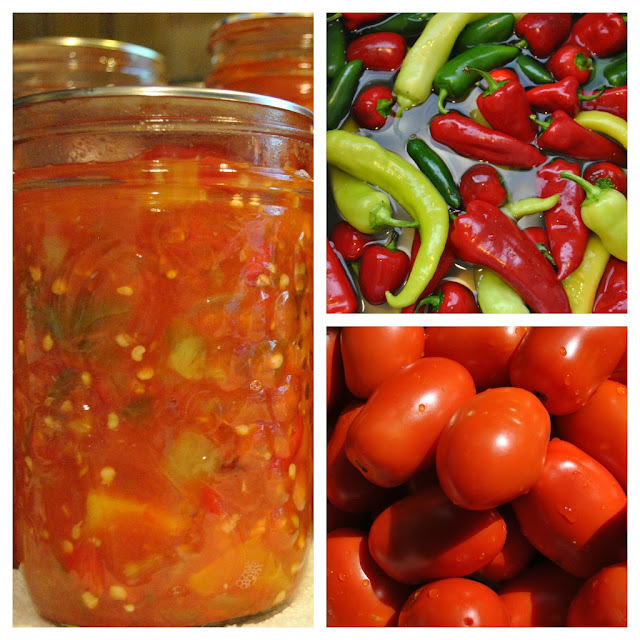 Years ago, when I first started canning, I would diligently follow a salsa recipe in the Ball Blue Book of Canning. Apparently, it was too mild for my hubby's taste, so I started experimenting with adding various hot peppers to kick up the heat. Salsa making is more labour intensive than most anything else I can, due to all the veggie chopping it entails (I hand chop everything but those hot peppers), but it makes a thicker salsa which is so worth the work. Once I had used up all my onions, bell peppers and assorted hot peppers, I chopped up a few ripe peaches to make the salsa extra special. Salsa complete, several pounds of romas remained. They were canned on their own. Are you still following the Bowls with Borders Blog Hop? I am! Need the full schedule? Carol has it! Since yesterday was my birthday, and I ended up working a 12+hour day assisting my husband in a custom kitchen installation... I feel the weekend should be dedicated to sewing. I've got a little project underway, a gift for a friend, that I really want to finish. I hope you've been hopping along and leaving comments when you visit. You know that there will be some giveaways along the way... plus the chance to win some prizes at the end of the hop? You don't want to miss out! Looking for the full blog hop schedule? Ready? Let's go check out the blogs listed below as today's stops on the Bowls with Borders Blog Hop. Welcome! I hope you're having a great time visiting all the blogs in the hop. You are leaving comments on each, right ? ...*hint, hint* It means so much to receive your comments and be cheered on. Thanks for being here! 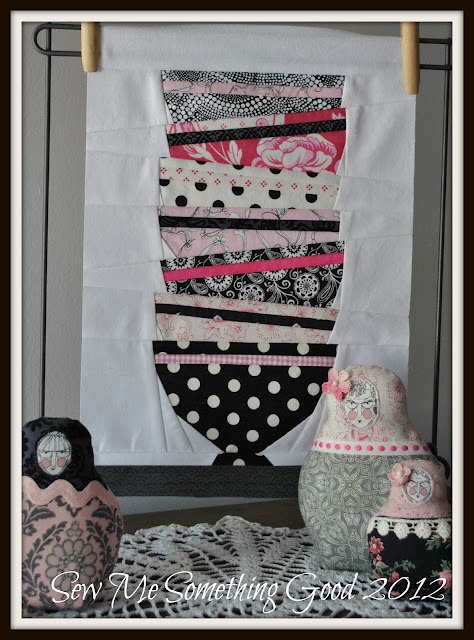 If you haven't tried paper piecing yet, this pattern is a great one to start with! My Ghastlie babushka dolls had to make an appearance alongside, as they match so nicely with these bowls! By the way this is an enlargement of the original pattern. I went for a block that would finish at 10.5"
Thanks to Regina for allowing use of her cute bowl pattern. How generous! (Want her pattern? Click here for details). Now before you head on your way to see the rest of the bowls being shared today, I want to let you know that if you need the full blog hop schedule, you can find it at Carol's. Many thanks to Carol for being our lovely hostess, and to our inspiring head cheerleader, Madame Samm, for making this blog hop happen! It's a new week and today is the kick-off of a fun new blog hop! Ready to be inspired and have some fun? ... Yes! Here's the talent lined up for today... Enjoy! Hope to see you on the blog hop! Don't worry if you're just finding out about the hop. You can still visit everyone that has shared so far AND remember, there's still 2 days left. Santa Lesley (our lovely hostess for this hop), has the full schedule (click here). Enjoy!